The hotel has two storeys and offers independent accommodation for both short stays and holiday apartments. It has 77 comfortable rooms, a 24-hour reception desk, a wellness area with a sauna, a fitness centre, a games room, a conference area, a restaurant, a bar, a large car park and garage parking available on request with CCTV monitored parking places. 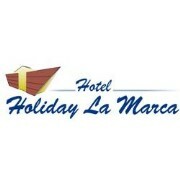 Designed to satisfy even the most demanding guests, Hotel Holiday La Marca also offers an organised games room with the latest video games, a laundry service returning ironed clothes within 24 hours, coin-operated washing machines and tumble dryers, a daily cleaning service with a change of linen, a porter service, room service, stationery and a fax and photocopying service.